Remember to pick up a Wooden Nickel at checkout each time you shop! - The Wooden Nickel collector is located at the Customer Service desk. Choose which non-profit you'd like to support that day, and drop your wooden nickel into their column. - At the end of the 3 months Basics will cut a check to each non-profit equal to 5 cents per wooden nickel. A simple way to show cooperation at work in our community. Thank you for participating! 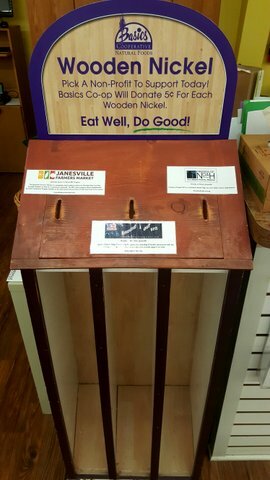 The Wooden Nickel program is one way your Co-op helps increase awareness and donate to 12 local non-profits annually. Since there are so many amazing groups to choose from, we ask our Co-op Owners to help us narrow the list. 57 Owners took the survey 4/29/18 - 5/5/18 to choose from more than 50 local groups!